Turkish American Taxi Business Began to Work in the U.S.! In total, 26 thousand 500 units in New York City Taxi Ford Transit Connect taxi tender Gölcüklü finals for the first time the New England region of the United States began the task. 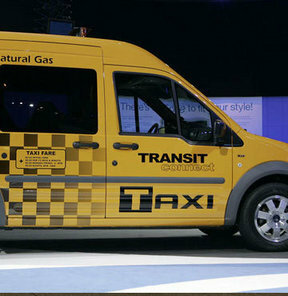 Ford Otosan, according to the company, the New England Auto Show Boston Cab Dispatch delivered tools to do the task begins, the state of Connecticut, the two companies can work with 40 pieces of natural gas has ordered 2011 model Ford Transit Connect taxi. Entering the North American market in 2010 and within a short time in the United States by the Boston Police Department Certificate of Conformity of the Ford Transit Connect taxi cab, was delivered to customers in the U.S. market first. New England Auto Show Dispatch’e delivered at a ceremony held in Boston Cab 2011 model Ford Transit Connect Gölcüklü taxis, the first Turkish taxi in North America are now starting to do the task.